♦ The clarinet has a wide range of notes, making it a very flexible instrument to write music for. It has a warm sound that can blend, and/or add color and dynamics to most any piece of music. ♦ Clarinet plays a lot in the band, and is featured quite a bit too. ♦ There is a wealth of music written for clarinet, making it easy for you to find something you like to play. ♦ Clarinetists are seldom alone in their section. There are usually several other students playing the same part, which can help you feel less self-conscious. 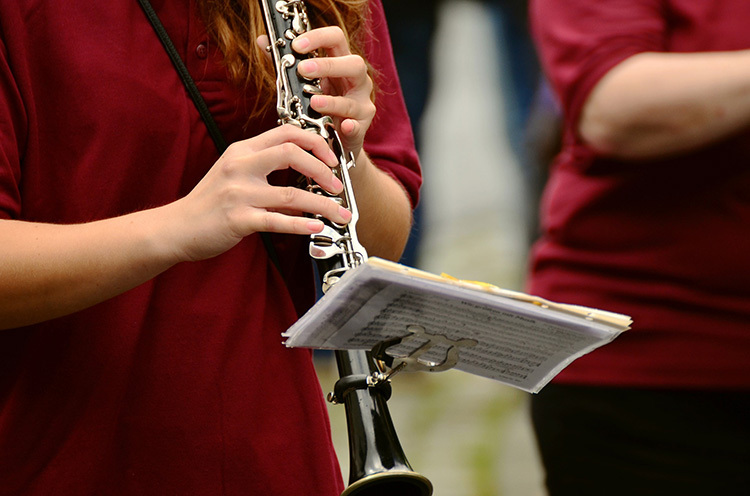 ♦ Once you learn to play clarinet you can more easily learn to play the other woodwind instruments, like flute and saxophone. ♦ Clarinets are easy to store and transport. ♦ Clarinets harmonize well with all the other instruments, so it’s easy to play together in duets, trios, quartets and groups of virtually any size, including band, orchestra, jazz big band, etc.